Perfect Curls Made Easy with CHI ARC. I am always on the hunt for the easiest way to do my hair. As my hair is finally growing out from a bad haircut and is longer, I am able to play and curl it more like I used to. I have been looking for larger barrel irons and have been obsessed with the CHI ARC Automatic Rotating Curler lately. 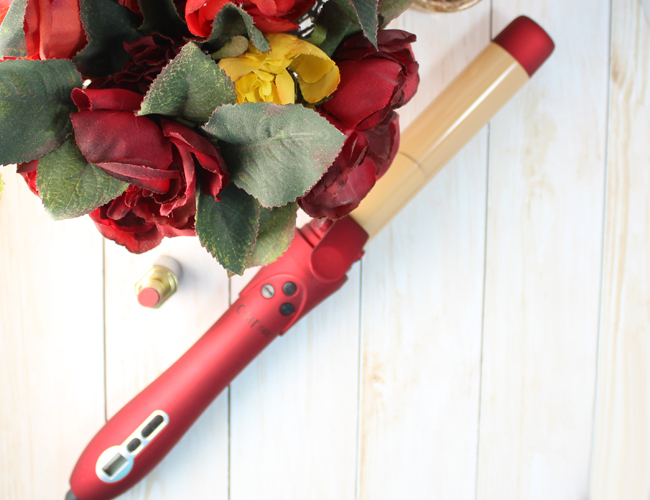 This curling iron gives my hair the perfect curls I crave in a flash! At the heart of my 1 1/4" CHI ARC is the automatic rotating barrel. It makes curling my hair so easy! It really is perfect for any user at any skill level. You see, this spinning barrel creates effortless curls with its automatic curling technique. You simply press the right or left control buttons to twirl the barrel (super easy to reset with the reset button - so smart) in the direction of curl, hold until you hear a beep and release.The rotation is super smooth and never pulls when rotating or gliding out of the hair. The ceramic heater reaches up to 410°F in just 30 seconds and the ceramic barrel ensures even heat distribution. The intelligent technology of this iron takes into account that the barrel should be held in the hair within varying intervals, according to different hair types which minimizes heat damage. Hair is left with a smooth beautiful curl, soft to the touch and frizz free. As I mentioned, I have been using the CHI ARC in the 1 1/4" size, but it is also available in a 3/4" barrel size as well. The CHI ARC sells for $129.95 at ULTA , JCPenney, other fine stores and salons.